Making eggs shouldn’t be such a big deal. You crack an egg on a sizzling pan and cook it in any fashion you’d like. Or boil them for hard boiled eggs. Or poach them. Easy peasy, right? 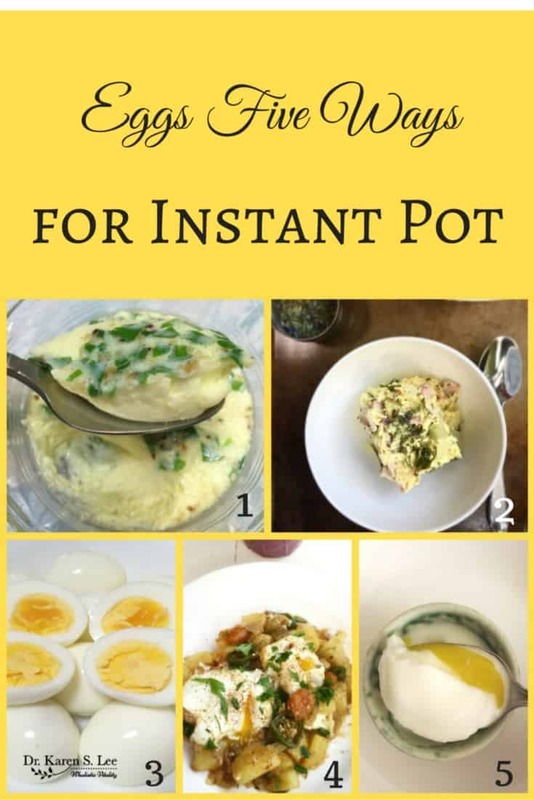 But did you know you can cook eggs in a pressure cooker? 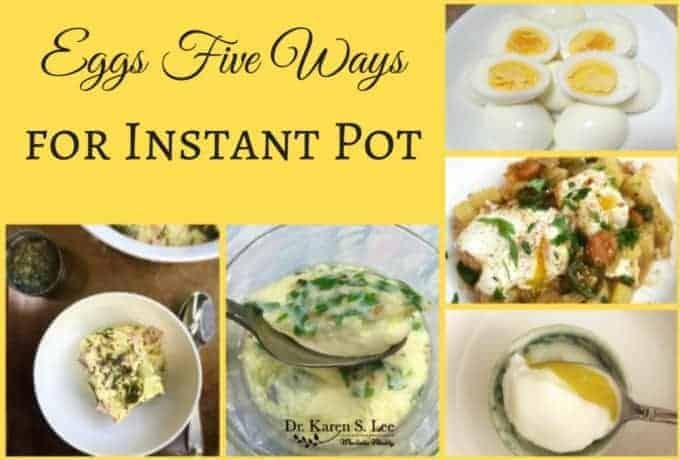 I didn’t either, until I started using my Instant Pot. In fact, it was the first thing I cooked after I unboxed it. Don’t ask me why I decided to cook an egg instead of something more substantial like a stew or a soup. It’s not like I was scared to cook a meal in fear that I’d ruin it since I’ve used pressure cooker before. But I just wanted to make a hard boiled egg for some reason. And good thing I did because since then, I’ve been cooking eggs this way for breakfast every day! 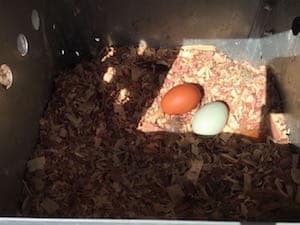 When I say, ‘eggs’, you know I mean eggs from chickens that were humanely raised while freely roaming the farm, eating worms, grains, seeds, or whatever the girls find on the land, right? I buy my eggs from the farmers market and they are always more delicious and fresh. The yolks are deep golden yellow, almost like mustard colored. When eaten raw (Yes, I slurp them raw and I lived to tell about it! But I wouldn’t dare eat store bought eggs raw. Eeek! ), they are sweeter than any eggs from the supermarket. And you know ‘organic’ eggs just means chickens were fed organic grain feeds but not necessarily ate whatever they found off the land while freely roaming, right? In fact, stay away from labels that says, “fed a vegetarian diet” because that definitely means, the chickens never ate worms. And chickens are NOT vegetarians! 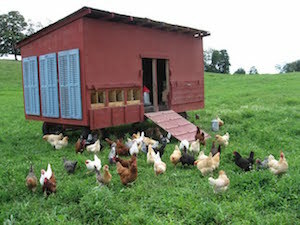 See these happy chickens that roam, lay eggs when they want to (see the green egg? ), and fertilize the grass so cows can graze? This was a scene at the Kinderhook Farm where I recently visited. These are happy chickens, let me tell ya. They lay good eggs. Starting with the best eggs is the key for making delicious egg dishes. Of course, if there is a downside to farm fresh eggs, it is not being able to peel the shells as easily, especially when you want soft runny yolk, poached eggs. So I’ve poached them in my ceramic tea cup to not to have to worry about shells, as pictured in #5. If you want hard boiled farm fresh eggs, don’t cook them right away. Wait a few days and they will be easier to peel. 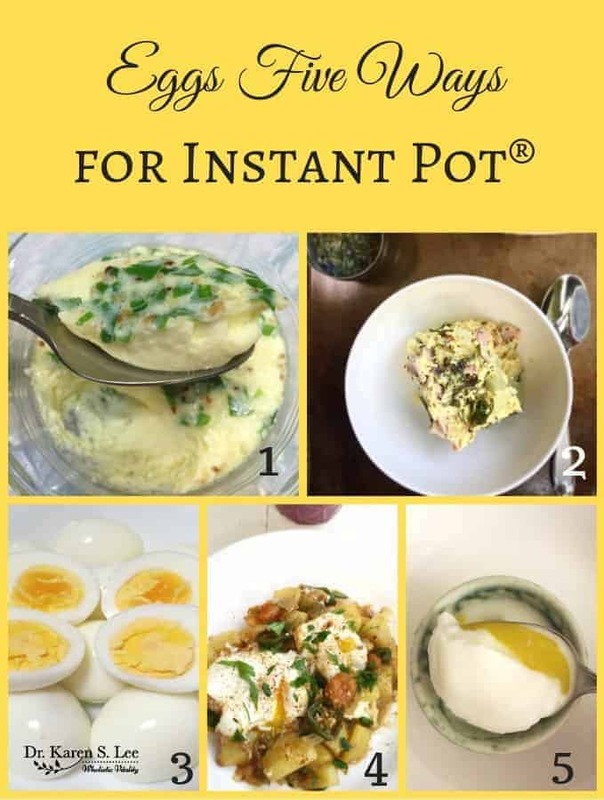 So let me share these five recipes so you can make your own for breakfast or “breakfast for dinner” in your Instant Pot if you win. I’m sure you can make it in any pressure cooker but I haven’t tried it in any other pressure cooker so you’ll have to adjust the time according to yours. QR – quick release – manually release pressure by turning the valve to ‘open’. Place a towel over the vent to dissipate the steam. Serving: 1 but you can easily multiply according to what you need and use a larger bowl. Add the rest of the ingredients and mix well and set aside. Place the bowl with the egg mixture on the trivet or steamer basket. Close the lid tightly, close the vent valve. Press “Manual” setting on HIGH and set the timer for 5 minutes. When the timer goes off, QR. 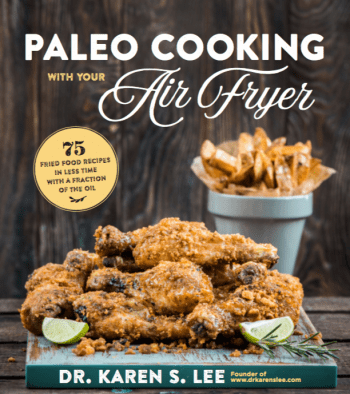 Serve immediately with hot rice! Pour the mixture into a heat proof dish and cover. Place the trivet or steamer basket inside. Press "Manual" on HIGH pressure for 20 minutes and NPR. Eggs. It doesn’t matter how many eggs. Cooking time is the same. Just make sure the shells are not cracked. Place the eggs on the trivet or steamer basket. Press “Manual” on HIGH pressure for the following styles of finished yolks and QR. Right after QR, take the eggs out and place them in a bowl of cold water. Change water as they get warm to keep the water cold. Refrigerate the eggs when they feel cold to touch. – Farm fresh eggs are harder to peel so I used a tea cup to poach so I wouldn’t have to struggle to peel. Re-heating is easy too! Just “Steam” for 1 min and QR and you now have soft warm eggs like they were just made! Pour 1 cup of water in the inner pot and place the trivet inside. Place the bowl with cubed potatoes on the trivet. 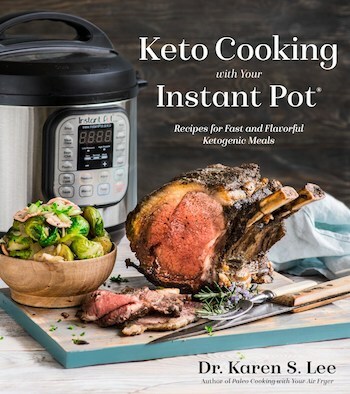 Set Instant Pot on Manual for HIGH pressure for 2 minutes. Or you can cook the whole potatoes for 3 minutes and cut them afterwards. Meanwhile, chop onions, bacon, jalapéno pepper and cilantro. When timer goes off, QR. Remove the trivet and drain the water. Set Instant Pot on "Sauté" and wait until the screen says, "Hot"
Add bacon fat or butter and sauté onions until translucent. Add potatoes, bacon, pepper, cilantro and taco seasoning and mix well. Pat down the potatoes to create a little crater in the middle. Crack both eggs gently into the crater of the potato hash. Set on HIGH pressure for 1 minute. The eggs should be done like they've been poached. Using a flexible spatula or a flat wooden spatula, lift the potato hash with the eggs on top, without breaking the egg yolk. There you have it. 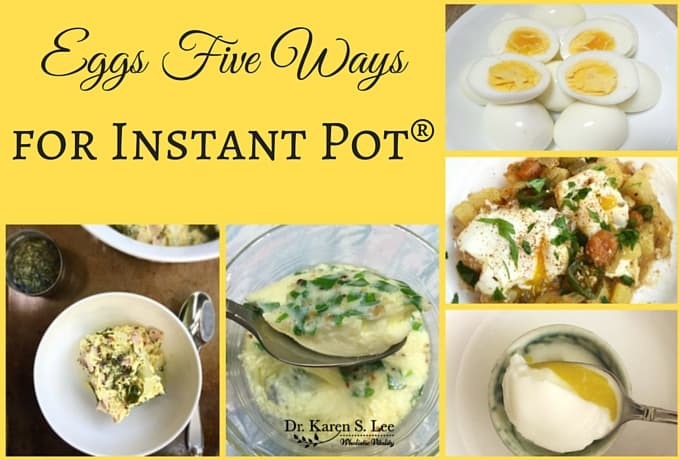 5 eggs done differently in a pressure cooker!